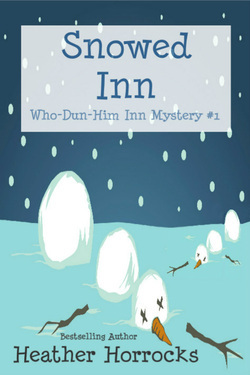 It's all part of the killer grand opening murder mystery weekend at her new Who-Dun-Him Inn. But a storm's brewing on Porter Mountain and, before the snow settles, a guest winds up dead--as in really, totally, and permanently. Now snowed in with a murderer running loose, young widowed mom Vicki is forced to keep her family, guests, and actors safe while searching for clues. Her author guests, also the prime suspects, try their hand at solving this real-life whodunit, thereby hindering the investigation by local law enforcement officers. Things really go downhill when her twin Liz shows up, trailed by flamboyant Grandma Ross, who announces shes seeking a boy toy among the suspects. When both a local younger man and an out-of-town newshound start sniffing around the inn--and her--Vicki realizes she's got more problems than just a murderer on her hands. Can she solve the mystery before the murderer strikes again -- or will this case of opening night jitters prove to be terminal? “Uh,” I said, disoriented. When the doorbell rang, I’d expected to find Sharon, my cook for the evening, who was already an hour late. But, instead, it was Liz and Grandma standing on my porch, bundled against the October weather. I looked behind them. I really, desperately needed my cook. An hour ago. This was my grand opening weekend and it had to go perfectly. I’d invested most of the insurance settlement into the purchase and renovation of my family’s Ross Mansion into the WhoDunHim Inn. And every dime I’d spent had stung with guilt because I’d rather have my husband Robert back than any amount of money. She tightened her arms to end the hug, making my breath whoosh out of my lungs, before letting go. She was in darn good shape for a woman her age, always well put together, with flattering makeup and expensive hairstyle. And she exercised more than I did. As they hung their coats on the hooks on the wall closest to the entry. I closed the door behind them and followed Grandma into the Mayor’s Parlor. She sank down onto the Queen Anne loveseat that used to belong to her and Grandpa George when they ran the Ross Mansion Bed and Breakfast, before my parents had bought it. I looked around, thinking of all there still was to do. But surely I could give my family five minutes. And that thought shot my panic level up another notch. “How long before everyone arrives?” asked Liz, looking out the window. When I sat beside her, she continued patting, now on my arm. “Take a deep breath,” she suggested. I hated that word. At twenty-six, it didn’t even seem possible. And yet here I was. I looked from one to the other--Grandma Ross imitating an exotic wrinkled parrot in yellow slacks and bright striped blouse and my sister elegant in a new black-and-rose pantsuit--and took comfort from their loving presence. “I’m not surprised,” I said, but at least I was beginning to feel like I could breath deeply again. “So all the renovations are complete?” asked Liz. “I brought you some pseudo-bubbly,” said Grandma, rummaging in her huge purse and pulling out a champagne-shaped bottle filled with her favorite nonalcoholic grape juice, and handed it to me. “What is that?” Liz gasped, reaching toward Grandma’s purse. Grandma grabbed something and clutched it to her chest. Speechless, I stared at the cannon in my grandmother’s slightly shaky, liver-spotted hands. “I’m pretty sure I don’t want to hear this.” Liz’s stiletto heels tapped across the hardwood floor toward the fireplace, her hands headed toward her ears. “Good gravy, George has been dead for more than a decade. My mourning’s done. And I’ve still got some kick in these old legs.” Staying seated on the loveseat beside me, she kicked up an old leg to prove it. “Running out of money, are you?” I asked. “Then conceal it,” snapped Liz. While she and Grandma both make me insane, they drive each other even crazier. Probably because they’re so much alike. Grandma frowned and appealed to me with a glance. Grandma gave a heavy sigh and shook her head. “And to think I was considering moving in with you, Vicki Butler, instead of staying with your parents.” Grandma said it like me learning that tidbit would devastate me. Ha. I looked at it more like I’d just dodged one of her bullets. “You can’t move in with Vicki. She doesn’t have time to entertain you.” Liz winked at me. And she was right. I didn’t. Grandma was loveable, but definitely high maintenance. She was staying with my parents for two months while her fancy home was remodeled, and she was referring to her daughter-in-law and my mother, former PTA President and current Relief Society president, married thirty-five years to my father. Liz and I may have identical red hair, brown eyes, and freckles, but our personalities definitely forked on the family tree--Liz roosted partway out on the feisty branch where Grandma (who regularly dyed her hair red and proclaimed herself our triplet) perched, while I nested with my mother on a more sedate limb. Life has an annoying way of presenting two important events at the same time for us mere mortals to be forced to choose between. My parents had struggled with the decision, but finally they’d traveled to Spain for a week to bring my brother home from his mission. Otherwise, they would never have missed my grand opening. They’d told me repeatedly how sorry they were. “You girls never want me to have any fun.” Grandma sighed and pulled the gun back out. Liz took it, dropped six huge bullets into her palm, smiled sweetly and handed it back to Grandma. Our grandfather had taught us gun safety when we were teenagers. Relief flooded me. Grandma with an unloaded gun might prove to be an irritation, but at least no one could get shot. Grandma huffed and headed for the hall. “It’s not a dungeon any more,” I protested, thinking of how nice I’d made our family quarters downstairs. “Use the elevator,” I called out, glad to have her at least going to the family living space. “Who?” asked Liz from behind me. I motioned her to silence. “The road up to your place is slick as a snail’s bottom. She slid off across from Horse Feathers.” That was the dude ranch five properties below us on Porter Mountain. Dismayed, I said, “I was sure the weatherman said it was only going to drop an inch of snow and move on,” I said. Crossing to the front door, I touched the original Tiffany-style stained glass pane, and the cold on my fingertips made me shiver. Gray clouds hovered over the mountains on the far side of the fertile valley and a few inches of new snow frosted the ground, but it wasn’t snowing now. Apparently it had lasted just long enough to take my cook out of commission. I hoped it wouldn’t keep the guests holed up in a Park City hotel. Okay. I could do this. I could talk Grandma into cooking for me. Grandma was the least senile person I’d ever met. So she could handle the work she’d done for decades. If she just would. And if she was in one of her persnickety moods and said no, I’d beg her. Grovel. On my knees, if need be. Click below to buy the Kindle version.